After signing to the DinDisc label, OMD’s manager Paul Collister negotiated an advance so the band could construct their own studio in the heart of Liverpool. 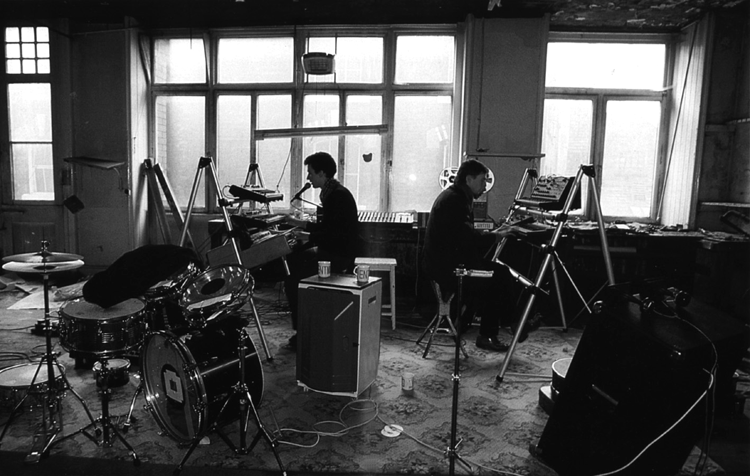 The idea of their own studio, inspired in part by Kraftwerk’s own Klingklang studio, made sense as it gave the band a secure place to write and record in the future. Their choice of location was above a music shop in the Mathew Street area, directly across from Probe Records and just down the road from Eric’s Club. Mal Holmes’ father oversaw the renovation work while Paul Collister worked on the electrical and sound proofing work for the studio. It was a rough and threadbare workspace, but perfect for working on demo material. Christened The Gramophone Suite, the studio was finally completed in the autumn of 1979. After all the work on the studio, Andy McCluskey and Paul Humphreys felt under pressure as DinDisc had announced that OMD’s debut album was due for release the following February. Ironically, after constructed a place of their own to work in, Andy and Paul felt a need to record subsequent albums elsewhere. By the mid 80’s The Gramophone Suite had been dismantled and the equipment moved into storage. It had provided a safe haven for OMD’s early career, but like much of the band’s desire to capture new sounds, it had served its purpose.